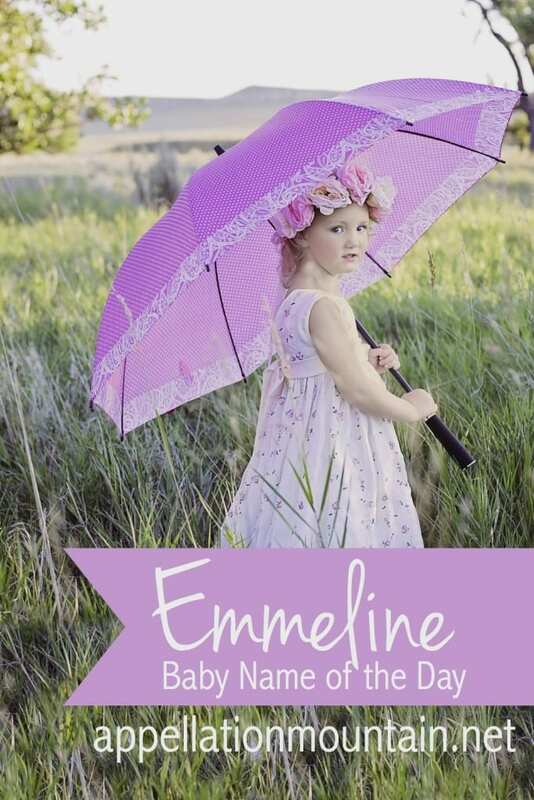 Emmeline takes favorites like Emily and Emma, and gives it a sweetly vintage, slightly tailored twist. Thanks to Alicia for suggesting our Baby Name of the Day. Strictly speaking, Emma developed as a diminutive of the Germanic Ermentrude, or any of the many names starting with Ermen-, which means strong. Emily, on the other hand, is cousin to Aemilius, a Roman family name meaning rival. Here’s where it gets interesting – Emily was first introduced to English-speakers when it was used as the English form of Amelia. That’s because of the German-born daughter of the German-born King George II of Great Britain, Princess Amelia Sophia Eleanor. But Emily isn’t a form of Amelia at all, and Amelia doesn’t come from Aemilius, though it looks like it could. Instead, Amelia comes from the Germanic element amal – work. Amelina is a diminutive for Amelia. Whisper it down the alley, and you’ll arrive at our Baby Name of the Day. In 1788, Charlotte Turner Smith chose this name for the heroine of her novel, Emmeline, The Orphan of the Castle. It’s very much a Cinderella story. It appears the name was in sparing use in England for many years. The name was worn by at least one prominent American suffragette, as well as two noted suffragettes in the UK, including Emmeline Pankhurst. There was also a writer in the same era, who penned true tales of English governesses abroad. A twentieth century novel about a nineteenth century girl inspired a modern opera, also called Emmeline. It wasn’t such an outlandish choice, though – Mark Twain used the name for a poet and painter in his 1885 novel, Huckleberry Finn. The name became familiar to recent generations in 1980. That’s when blockbuster The Blue Lagoon gave the name to a young, shipwrecked Brooke Shields. The movie was set in the Victorian era. There’s a tiny uptick in the name’s use immediately following the movie’s release – from a dozen or fewer girls most years pre-1980, to closer to two dozen most years following. But The Blue Lagoon wasn’t enough to launch Emmeline. Despite the name’s vintage style, it had never before charted in the US Top 1000, though Emmaline and Emaline were both occasionally used. Anne of Green Gables fans might recognize Emmeline Harris, a character added for the 1987 Anne of Avonlea television movie. It’s another case of the name being chosen to convey a nineteenth century vibe. JK Rowling used the name for a minor character in the Harry Potter series, a member of the heroic Order of the Phoenix. There’s also an island near Antarctica, a Tongan diplomat, a Japanese manga character, a song by Ben Folds, an actress from television’s I Dream of Jeannie and the nanny who drops to her death in Disney World’s Hollywood Tower of Terror attraction. We love our Em- names, from Top Ten favorites like Emma and Emily, to surnames like Emerson and Emery, as well as Emilia and Ember. 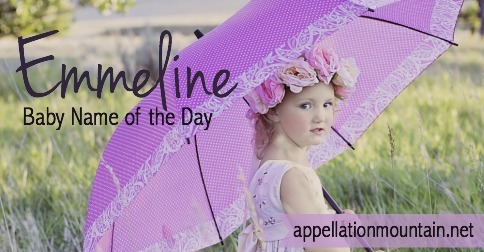 Ends in -line names like Caroline and Madeline are traditional choices for girls. Emmaline re-entered the US Top 1000 in 2012, and Emmeline followed in 2014. Both seem poised to rise even higher, a perfect compromise between the very popular Emma and the modern Emerson. What do you think of Emmeline? Do you prefer it spelled Emmaline? This post was originally published on August 3, 2009. It was substantially revised and re-posted on March 22, 2016. My daughter’s name is Emeline Susannah. She is 10 years old, and I still love the name. We have gotten so many compliments over the years. I was actually trying to give her the most common spelling of the name, but I do think the Emmeline spelling is more popular. I recently found out my great great Aunt was actually named Luisa Emmaline, so it is in the family after all. My daughter has enjoyed going by Em, Emma and Emily at times as she loves to play with her nicknames. I just have one daughter, and I dreamed of little girl names since I was a little girl myself. I am very happy with my choice ;). My 9 year old is named Emeline. I liked the stream-lined spelling, plus there is an ancestor in the family with that spelling. We pronounce it Eme-line. I think this is a happy, bouncy sort of a name. Our Emeline’s middle name stars with a “B” so we call her Emeline Bea all the time. Happy girl, happy name. Of my girls I thought Miriam and Harriet were a style match, Emeline and Annabel were a style match, and Clover was the odd duck out. That’s so funny- I hear Emeline and Annabel as a perfect sibset. I think there’s often a disconnect between the way the name-obsessed hear a name and the way the not-so-obsessed do. I love Emmeline (emma-line) and the nickname Emme! Hi, this is really interesting, I have enjoyed reading everyones posts. I’m an Emmaline (Em Mah Leen), often teachers would call me Em Mah Line – which I wasn’t happy with, mainly because that wasn’t my name, I am known to some people as Emma and to my close family as Emmaline and to my husband I am Em. When I was young I didn’t like my name but at 35 years old I love my name because it is so unique. The poetic Evangeline was featured back in 2008! You can read the post here. My daughter’s name is Emmeline, and I noticed that you posted this on my birthday – how awesome! I prefer the MM spelling myself; I found more references to that spelling, with Emeline being a variation. Thanks for making this the word of the day! I’m a variation of Emmeline – Emmaline (obviously) and I’ve been taking some time to adjust to it. I used to not like it, because I thought it was annoying (when I was little) so I went by Emm and Emma for a long time. When I entered high school, I realized how common and almost boring Emma was, so I started going back to the full version. The pronounciation of this type of name is very troubling to different people. because of it’s different variations and countries it originated in/is popular in, it has quite a few. I was born as Emma-LINE, but most often I’ve been faced with Emma-LEEN, Emma-LYNN, and several others. Currently I’m becoming an Emma-LINE again, but I’m thinking about shifting the pronounciation to Emma-LEEN, because that is what I think represents my character best, a little more artsy, different (well, in the US; usually we us the LINE pronounciation – CaroLINE, MadeLINE (my sisters name), etc. – and EmmaLEEN stands out more). I don’t like Emmalyn as much, it feels very tryndee. I just met a little Emmalyn this past week. I thought it was pretty, but it seems like it could be confused for many other names as she gets older. 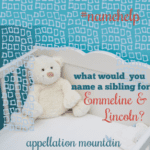 I quite enjoy Emmeline, but it’s too similar to my sister’s name, so I don’t think I’d use it, not even as a middle because then there’d questions to answer about why we only chose to name her after my sister and not my brother, sister-in-law, blah blah blah. Diane Setterfield’s The Thirteenth Tale features twins named Emmeline and Adeline. Since the novel’s in the Gothic tradition, the names are both quite appropriate IMHO (Charlotte Smith’s Emmeline from the novel of the same name and Ann Radcliffe’s Adeline from The Romance of the Forest). I have always liked Emmeline. My interest was especially piqued after hearing the catchy tune by Ben Folds, it made me appreciate the Emaline spelling more. I love the (EM-meh-LINE) pronunciation. I like this name very much, and this is also the pronunciation I prefer. However, I’ve never heard the Ben Folds song, and I like the spelling “Emmeline” best. Emmeline is a very pretty name and I agree that it is “a little different.” I think that’s probably why, despite how lovely it is, that I’m not greatly drawn to it. There’s still the likelihood that she’d be Emma plus last initial in her classroom. But it is nice to have a full-name option if she wants it. It’s a great way to both ‘fit in’ and ‘stand out’ just a bit. I actually like this name, a lot — I’ve considered putting it in a combo as a middle name to honor myself, as well as Amelia. (In my Latin class, they made us take Latin names, and I chose Aemilia Maria.) Even though Amelia and Emmeline aren’t directly related to Emily, it’s enough to get the point across that it’s honoring me. It’s a little too frilly for me. I would be more likely to use Emma, which I find short and sweet, and – of course – overwhelmingly popular. Also, do people really name their children after themselves and call it “honoring myself”? That seems a little…vain? I might honor someone else (we did my FIL with Ethan’s MN), and hope that someone might someday honor me (Ethan’s children), but honor myself? Seems a little off, somehow. While I’m not big on honoring in general, the feminist in me says, ‘men name their kids after themselves regularly – think of all the Jrs out there – so what’s wrong with a woman doing it?’ It’s not part of my personal naming style and I’d feel a bit odd doing it myself, but why should it be a perpetuated double-standard in this day and age? Well, in all likelyhood, if I were to honor my first name in any way, that would probably only be in I were on my eighth daughter. I like the idea of using Maria (my middle) as a middle name because it honors not only me, but my mother’s deceased little sister. But the chance of me actually using a name fully-blown after me? Probably won’t happen. In case what I said in my first comment was confusing, Amelia/Emmeline to honor myself wouldn’t be a first name, only a middle name. I bear my mother’s first name as my MN, as she does her mother’s. It’s a nice tradition if it feels right, I guess. I had no interest in doing the same. For me it felt a bit self-important and just unnecessary to continue. Allison got what I was trying to say. Also, the term “honoring myself” seems a bit over the top. Weird thread. You did carry the child, create the child’s body, and hopefully do a decent job raising said child (or at least do your best), why on earth wouldn’t it be appropriate to give the child your name?? Plus, we tie our children to our family lines with honor names all the time. Why should the mother be left out?? That seems like a bizarre self-righteous humility there. Emmeline’s lovely, though I prefer Emeline. […] from the boys’ list, and I’m delighted to see Liv.